Several long term studies have presented compelling evidence, and fundamental reasoning, that trend following is an investing approach that delivers good risk adjusted returns. First up is AQR’s A Century of Trend Following Investing, where the authors present evidence to show that a combination of relatively simple trend strategies operating over 1, 3 and 12 month time windows delivered strong risk adjusted returns (full period sharpe ratio of around 1), over 100 years after adjusting for fees and transaction costs. 59 “markets” were studied across equity, commodity and fixed income with the bulk of the early part of the dataset being equity and fixed income data. The strategy held a long or short position in each “market” according to the historical performance in the lookback window (1,3 or 12 months). The correlation of the strategy to equities was around zero for the full period and generally less than 0.35 in absolute terms in any given decade. Individual positions were sized and aggregated by scaling according to the inverse of their volatility. Second, we have the contribution by Steve Thomas and Andrew Clare of Cass University : The Trend is Your Friend. The slight difference here was that the authors looked at trend following both as a approach to allocating between individual sub-asset classes (such as regional equities or individual commodities) as well as an approach to allocating between asset classes, also short selling was not permitted. The dataset was from 1994, spanning equity, bonds, commodity and real estate and again volatility-scaling (referred to as Risk Parity) was used in sizing the contribution of each position to the total portfolio. The trend signals used were 6-12 month windows. The results of both studies were pretty similar : over the full dataset, trend following produced good long-term risk adjusted returns, generally a sharpe ratio of greater than 0.7 in the multi-asset case. However both papers illustrate that such a strategy can experience drawdowns that last for significant periods of time. Both papers (which cover data up to the end of 2011) highlight the period 2009-2011 as a significant negative period for that strategy: AQR list it as the sixth-worst drawdown in the study’s 100 year history (29 months from peak to trough) and Cass show it as one of the only three year periods where the multi-asset trend following portfolio substantially underperformed the multi asset portfolio without trend following. An FT article in November of 2012 hit the nail on the head. Markets were experiencing the “wrong” type of volatility for trend following. What this means is, we were seeing substantial moves in markets, but they were occurring in both directions with no substantial trend. The size of the moves meant that trend signals were being “stopped out” quite soon after being initiated. 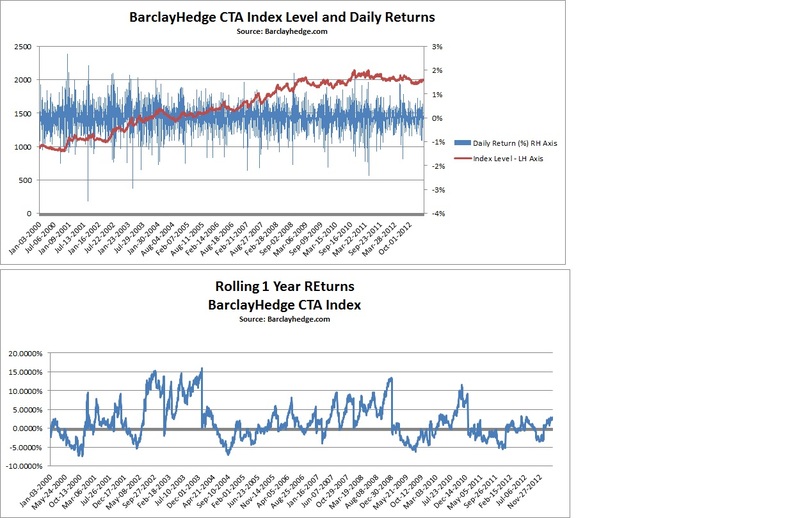 Quantitatively we can see this in the dataset available from BarclayHedge CTA index. This sort of behaviour was associated with the phrase “Risk on, Risk off”, a popular generalization that captured the way markets seemingly moved back and forth in response to macro themes, rather than moving in line with fundamentals. This article in today’s FTFM highlights a nascent improvement in the performance of trend following strategies (also visible in the BarclayHedge CTA data). The index was up nearly 3% in the first quarter of 2013, with examples of the sort of trades that have been profitable including long positions in Japanese equities, and short positions in the Yen and sterling. All three of which have developed into multi-month trends. If Risk on/Risk off is truly ending, perhaps trend following strategies will return to Business as Usual. Enter email to subscribe and receive notifications of new posts by email.